Wishing all of our friends, facebook & blog followers, past & future guests a very very happy Christmas and a prosperous New Year. Ullapool’s alternative Christmas tree & a trip to Corrieshalloch Gorge. 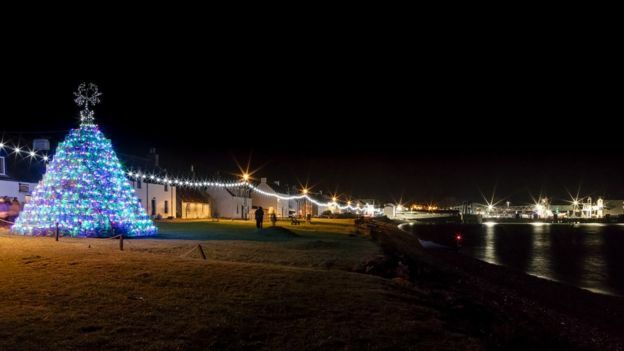 For the first time in Ullapool’s history they village had a Christmas Lights Switch on, unfortunately we didn’t make it to the switch on but we had a wander along West Shore Street to see the fantastic Creel Tree, made almost entirely of creels. Unfortunately we couldn’t stay to see it lit up but at 16ft tall it was pretty impressive. The photo below is on the BBC news site. After meandering around we made our way home & we stopped at Corrieshalloch Gorge national nature reserve just 30mins from the b&b. Corrieshalloch in Gaelic means ‘Ugly Hollow’, it’s far from ugly, it’s very dramatic with the 45m high falls of Measach directly below the bridge & there is plenty of flora & fauna to see. We spent over an hour with the gorge to ourselves. Admittedly we didn’t spend a lot of time on the shaky suspension bridge due to a certain someones fear of heights but we spent plenty of time wandering the paths, admiring the views & watching the wildlife. The gorge is part of the National Trust & at anytime of year is well worth a visit. The viewing platform has great views up toward the bridge, if you can spend long enough teetering at the end to take a photo! There were lots of birds flitting in & out of the deciduous trees so after a bit of patience huddled in the heather a Tree Creeper flew into a pine tree right next to us, he or she was busy at work searching for insects & bugs & didn’t stay long. It was also good to see Bull Finches, they were very skittish, everywhere we went to try & watch them, they flew in the opposite direction, boo! Today we woke to a wonderful winter sky – the calm before Storm Barbara! Hopefully Barbara doesn’t push Santa’s sleigh off course! We woke this morning to a stunning winters day. 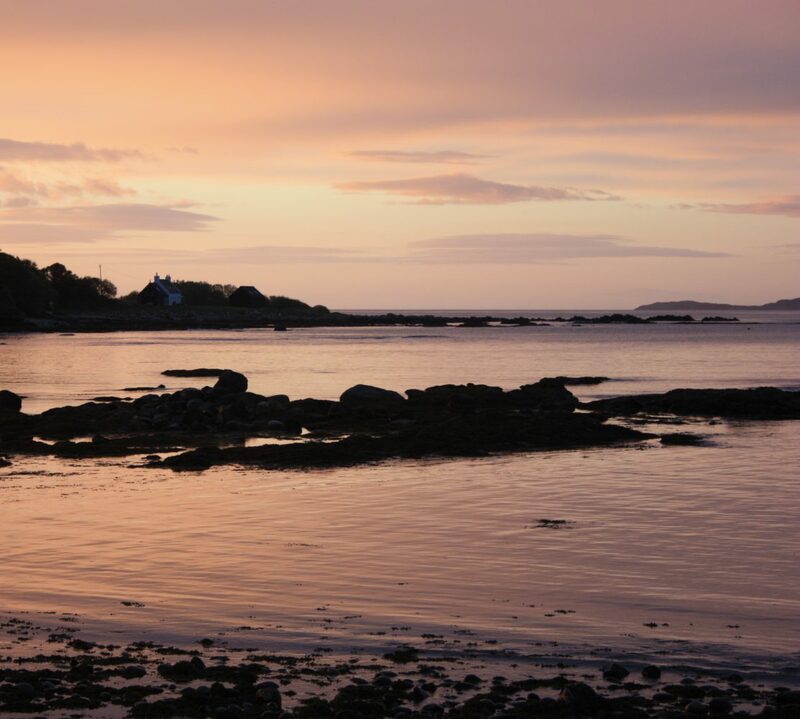 The bay was so still and the sun looked like he was ready for a full day of shining so we set out & decided to head down the road towards Udrigle House to see if the local otter was sunbathing on the rocks. Walking along the road we were talking how it was such a still day surely it was perfect conditions for spotting dolphins when low & behold we turned from the road toward the beach & up popped a pod of 3 dolphins (or harbour porpoise, not sure which) feeding and a few metres away another pod of 4 or 5, our first sighting of dolphins in Gruinard Bay. Whilst stood on the beach watching the dolphins the day just got better as the local otter surfaced with a crab in it’s mouth it headed for some rocks where it devoured its meal then splashed back into the water & had a swim around, the gulls were flying overhead looking for leftovers. When we got back to the house we had a look through the telescope to see if the dolphins were still around, a fishing boat was out toward the Summer Isles and a large pod of dolphins were feeding around the boat. Fantastic to see them from the house, even if they were very very wee.